The summer of 1987 saw a change to the United strip from the now familiar "VG" kit. 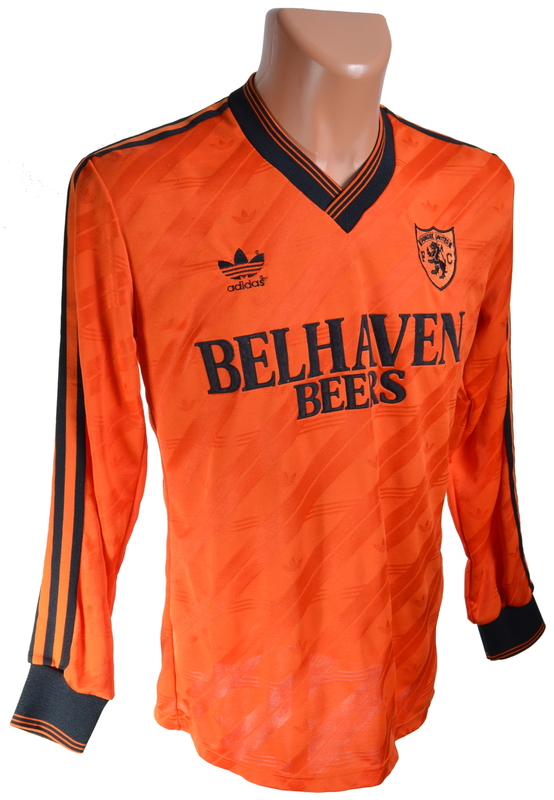 One major change was the shirt sponsorship, with Dunbar based Belhaven Brewery paying United a substantial figure for a three year contract, in what is believed to be the biggest shirt sponsorship deal in Scotland at the time. If they were to receive half the recognition that VG Foodstores received during their two year deal with United due to the teams European ventures and TV coverage, then Belhaven would have been more than happy. The black shorts and tangerine socks again remained the same, as they did throughout all of Adidas's time as kit suppliers, with the three stripes on the sides of the shorts and at the turnover of the socks. This Home kit first appeared competitively at Ibrox Stadium in the opening match of the 1987/88 season, where United earned a 1-1 draw against Rangers after taking an early lead. The kit was worn for only the one season, with the 1988 Scottish Cup Final against Celtic being its last appearance before a very small change to the overall look. Belhaven took a real hands on approach to the sposnorship deal, with large advertising boards in the corners of the ground, and even went as far as presenting a player of the month award.